From 21 to 23 April children from six countries will meet in the small town of Pelagićevo in the North of Bosnia-Herzegovina to play the 5th International Bulls Cup. The Bulls Cup will bring together 65 teams in four different age groups (Under 9, 10, 11 and 12) coming from Bosnia-Herzegovina, Croatia, Hungary, the Former Yugoslav Republic of Macedonia, Montenegro and Serbia. The junior tournament marks the start of a series of regional youth tournaments which are organised or supported as part of the new “Football Zajedno” (football together) project. The project “Football Zajedno - Promoting Equality and Non-Discrimination through Football” will run from this season until 2019/2020. The joint project is coordinated by the fairplay initiative and the Balkan Alpe Adria Project (BAAP) in cooperation with the football associations of Bosnia-Herzegovina, Montenegro and Serbia. Football Zajedno is funded through UEFA’s HatTrick programme. Participating football clubs include Red Star Belgrade and FK Partizan, Radnicki 1923 Kragujevac (all from Serbia), Obilic Herceg Novi (Montenegro), Cibalia Vinkovci (Croatia), Kelen Budapest SC (Hungary) and Bashkimi Kumanovo (Former Yugoslav Republic of Macedonia). More than 500 kids will come to Pelagicevo near Brčko this weekend to play football under the motto “Fudbal bez Granica” (“Football without borders”) and to stand up against discrimination and nationalism. The 5th edition of the Bulls Cup is organised by the football school BAAP Evrogol Pelagicevo and the Balkan Alpe Adria Project. The opening ceremony of the tournament in Pelagićevo near the town of Brčko is held on Saturday, 22 April 2017 at 13:00 hours. Murat Jaha of the Football Federation of Bosnia and Herzegovina (NFSBIH) and Radoljub Petkovic, General Secretary of the Football Association of the Republika Srpska, will welcome the participants. 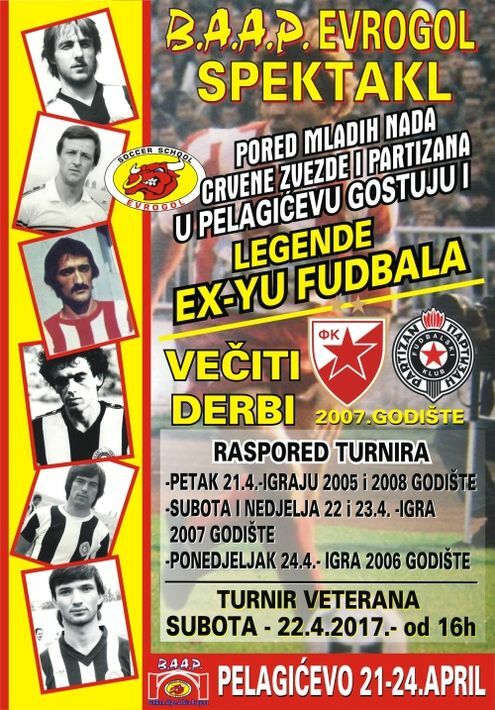 On Saturday afternoon a Legends Cup will be played, bringing together several high profile ex-players such as the former Yugoslav Internationals Milos Šestić (Red Star and Olympiakos Piraeus), Zvonko Zivkovic (Partizan and Benfica), Aca Trifunovic (Partizan and Ascoli), Milos Đelmaš (Partizan and OGC Nice), Nikica Klinčarski (Partizan Belgrade, now FK Teleoptik Zemun assistant coach), Dzevad Šećerbegović (FK Tuzla and Beşiktaş) as well as the former professional players Zdravko Borovnica (Red Star and SC Bastia) and Mersed Kovačević (FK Tuzla and Galatasaray).